If the president can get away with it...they can. Republicans have found that Trump's bullying tactics work up to a point. Then there's a backlash. Rep. Jeff Duncan (R), attacked CNN for reporting on AG Jeff Session's failure to account for two meetings in 2016 with Russian Ambassador Kislyak while applying for his security clearance. Duncan posted, "CNN's story was easily disproved within hours, and has since been removed from their website." It didn't take CNN long to reply with a tweet, "No, Rep. Duncan...we did not retract or backtrack on our story. We stand by our reporting. Those are the facts. So, once again facts have exposed another Republican bully trying to discredit the press. Republicans have learned from experience by watching Trump's thug-like actions. Many of them have chosen to follow in his dirty footsteps. Republican Greg Gianforte literally attacked a reporter, body slamming him, the day before the special election was held to see who would be the next senator from Montana. Because the attack happened less that 24 hours before the polls opened, it didn't have that much of an impact. Almost two-thirds of the votes had already been mailed in. Gianforte won by a narrow margin because Montana has been Republican for over two decades. But his Democratic challenger Rob Quist came closer to defeating him than most experts thought he would. Of course, Trump called him to congratulate him. I wonder if he sent Gianforte one of his old WWW belts? Look what the Republicans have shoved through the House; a monstrosity that was meant to destroy Obamacare. It was such a perfect example of bullying the poor and middle class that Senate Republicans have been forced to rewrite it. Apparently, there are still some Republicans that aren't buying the bully boy methods endorsed by Trump. 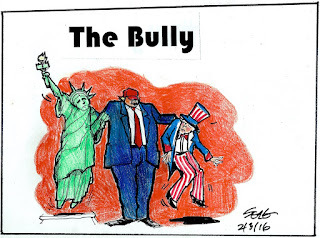 How long can this bullying policy go on? Did Trump go too far in firing FBI Director James Comey? Hopefully, we'll find the answers in the days and weeks ahead as several committees look into possible collusion between Trump's team and the Russians during the 2016 presidential election. The main bully boy, Trump, is in for hard times as a special committee looks into the possibility of him obstructing justice by trying to bully intelligence officers into dropping the Russian probe. One more thing. Trump's attempt at having a Muslim Travel Ban has been shot down by the courts. Again. The last recourse now is the Supreme Court.